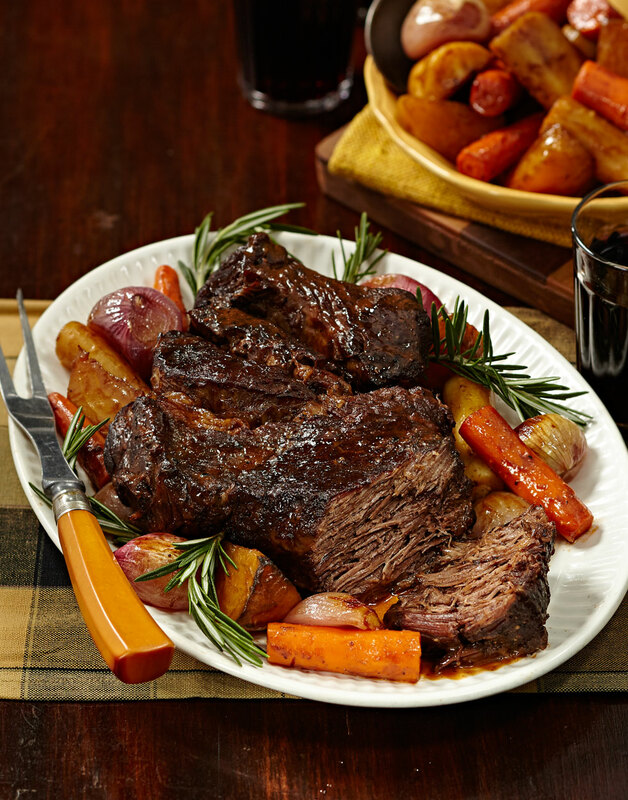 Pot roast is a perennial favorite, and for good reason. A warm oven gently heats the house, the beef braises for hours, and the wonderful aromas drift throughout, warming your tummy and soul. Then, save a bit of the sauce and roast for the best Hot Beef Sandwich of your life! Sear roast in oil in a large pot over high heat until deep golden brown on all sides, about 10 minutes; transfer to a plate. Sweat onions, diced carrot, and celery in drippings over medium heat, covered, until vegetables soften, 10–12 minutes. Stir in garlic and cook until fragrant, 30 seconds. Add tomato paste and Dijon; cook 2 minutes. Stir in flour, cocoa powder, and espresso powder; cook 1 minute. Deglaze pot with wine, scraping up any brown bits. Stir in broth, rosemary, and bay leaf, then bring to a boil over high heat. Return roast to pot, cover, and transfer to oven. Braise roast 3 hours. Transfer roast to a plate. Strain sauce, discarding vegetables and herbs. Return sauce and roast to pot. Add carrot pieces, shallots, parsnips, and beets to pot. Cover pot, return to oven, and braise roast until fork-tender, about 11/2 hours more. Transfer roast and root vegetables to a serving platter. Sear the roast until it’s deep golden brown to get the most flavor from the roast and for the sauce. Flour thickens the sauce as the roast braises. Adding it to the vegetables prevents it from clumping.